A delicious meal that’s effortless enough for a weeknight yet special enough for company, Honey-Ginger Shrimp Skewers are glazed with a sweet and tangy homemade BBQ sauce and served atop a bed of flavorful Asian Quinoa, infused with hints of soy sauce, garlic, and fresh ginger. Happy Monday, friends! I am so excited to bring you today’s post, because these gorgeous, glossy Honey-Ginger Shrimp Skewers with Asian Quinoa are part of a fun Mystery Basket Challenge that I’m participating in with 10 other fabulous food bloggers! So what exactly does that mean, you might be wondering? Well, have you ever seen the Food Network show, Chopped? 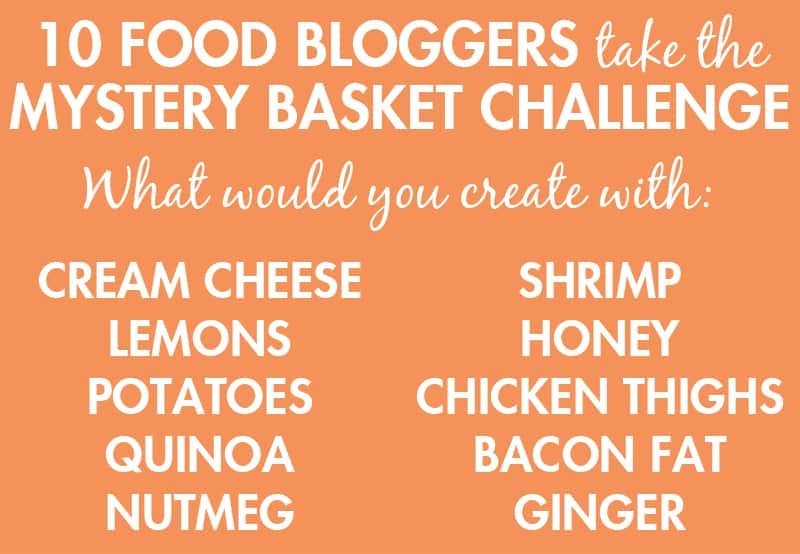 Basically, each blogger was presented with a “basket” (or technically a list, since we’re working together virtually here) of mystery ingredients, and we were tasked with coming up with a tasty, creative recipe featuring at least three of those ingredients. …and here’s what we came up with! 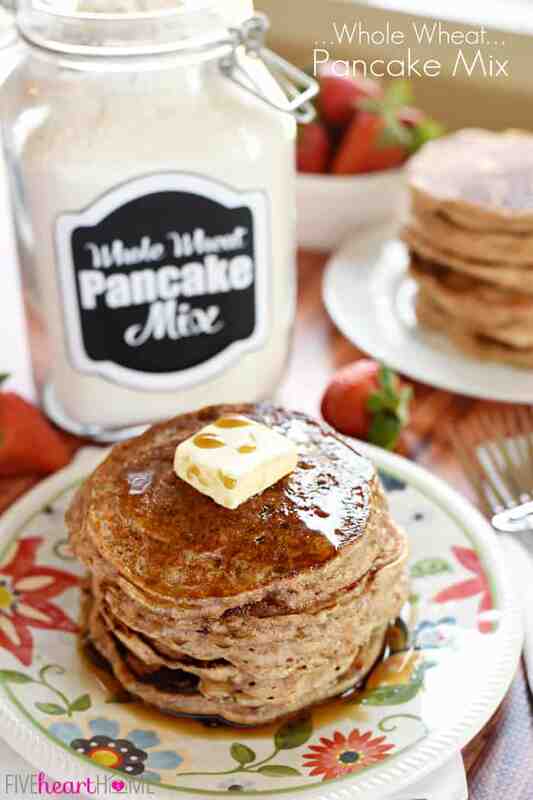 Can you say yum, or can you say YUM?! 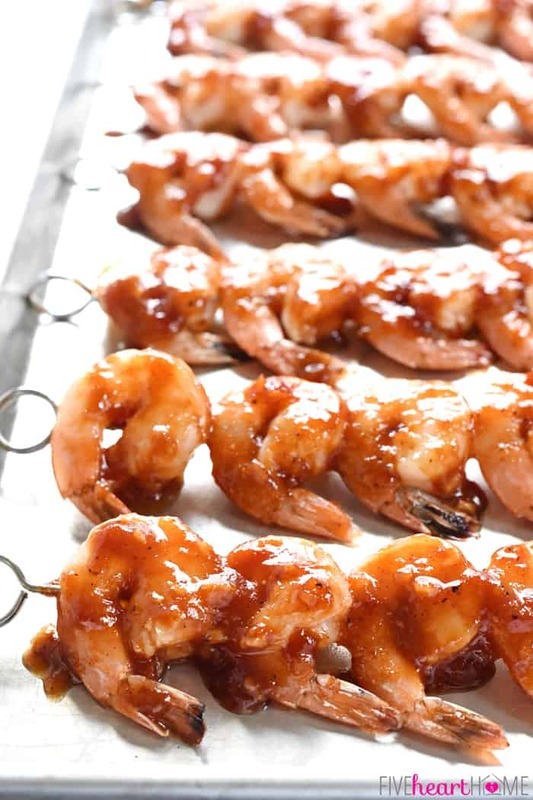 My contribution was obviously these happy little shrimp skewers, glazed with a homemade, Asian-inspired BBQ sauce that’s tangy from apple cider vinegar, sweetened with honey, and flavored with fresh ginger, garlic, and a dash of hot pepper sauce. 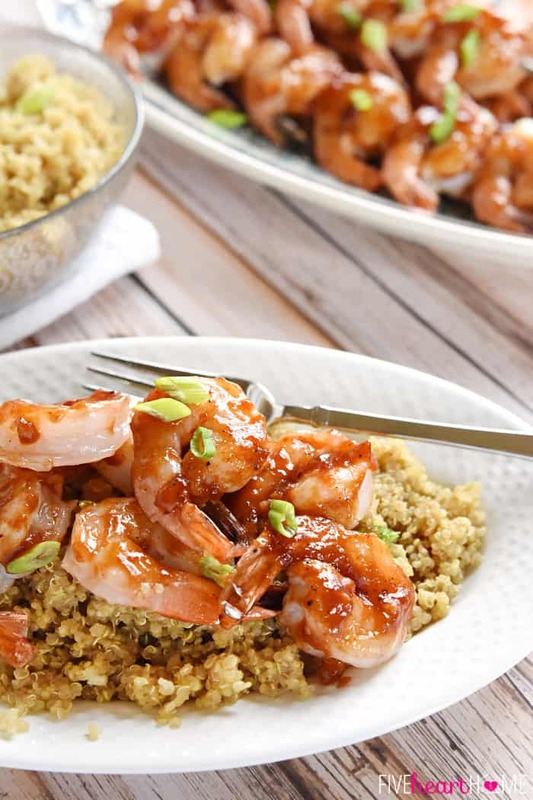 Then all of that mouthwatering shrimp is served over a bed of fluffy quinoa, but not just any quinoa…quinoa that’s been infused with flavor thanks to soy sauce, more fresh ginger, and garlic! When I saw the list of mystery basket ingredients, it immediately hit me that I’ve never before posted a shrimp recipe on the blog, so I decided it was the perfect time to remedy that. 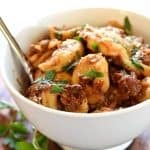 Shrimp is such a quick and easy protein to prepare, and while I often think of it as a special occasion menu item, it’s really amenable to busy weeknights as well. 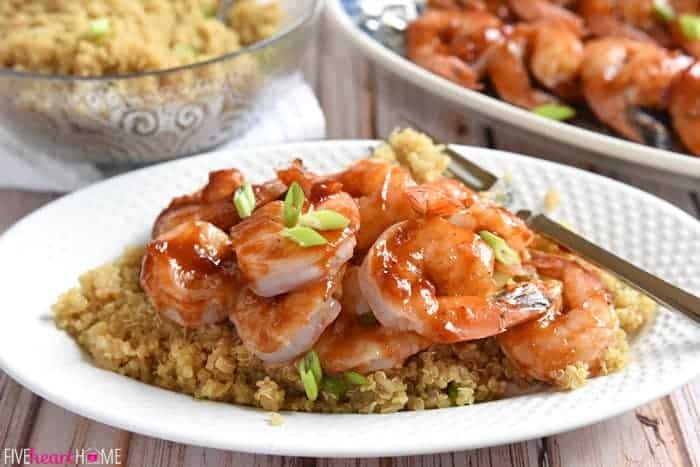 This recipe is as simple as throwing some ingredients in a pot for the BBQ sauce to glaze the shrimp, tossing a few other ingredients in a second pot to cook the quinoa, and finally, skewering and glazing the shrimp before popping it in the oven. So what does that minimal effort yield? 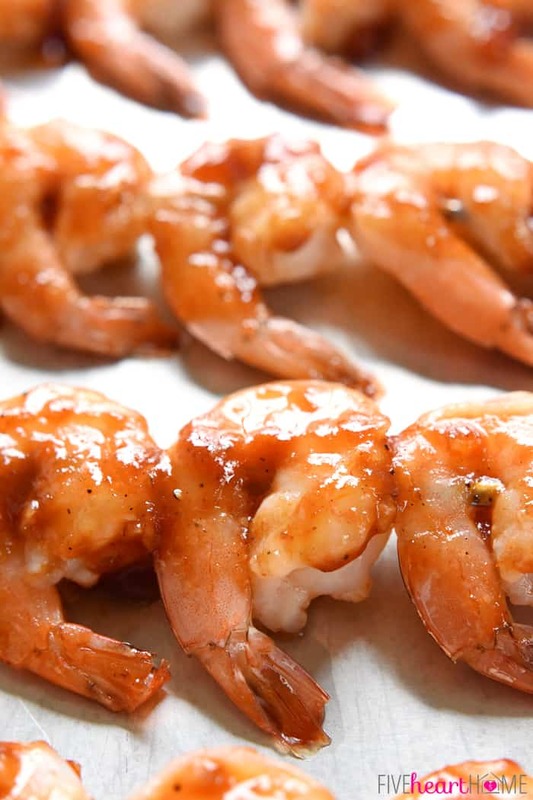 Well, not only does roasting render the shrimp tender and juicy, but the BBQ sauce coating it is AH-MA-ZING. I’ve always been a huge fan of fresh ginger, so I was excited to incorporate it into this recipe in order to give it a bit of Asian flair. And while honey is a delicious complement to ginger, vinegar keeps things from becoming cloyingly sweet while fresh garlic and Tabasco give the sauce a teensy kick. 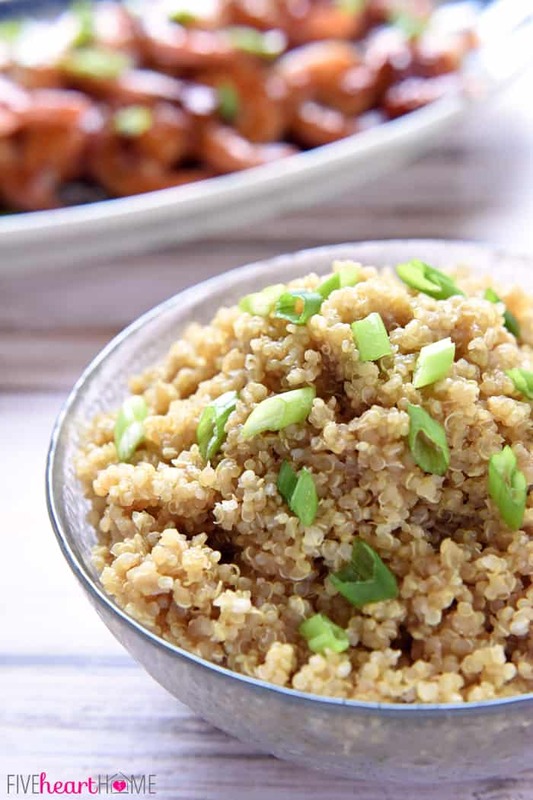 As for the quinoa…well, if you haven’t tried flavoring a pot of quinoa with seasonings and aromatics, might I suggest you remedy that ASAP? 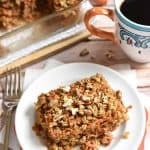 My family thought this fluffy, savory quinoa was about ten times tastier than eating it plain. The salty undertone from the soy sauce was also a nice contrast to the sweet and zesty BBQ sauce-glazed shrimp. 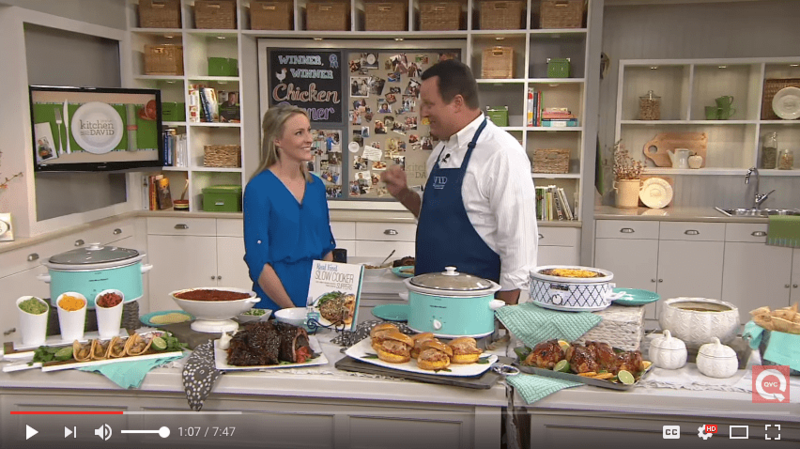 Don’t forget to check out ALL of the delectable, creative recipes in our Food Blogger Mystery Basket Challenge by hopping around via the links below! 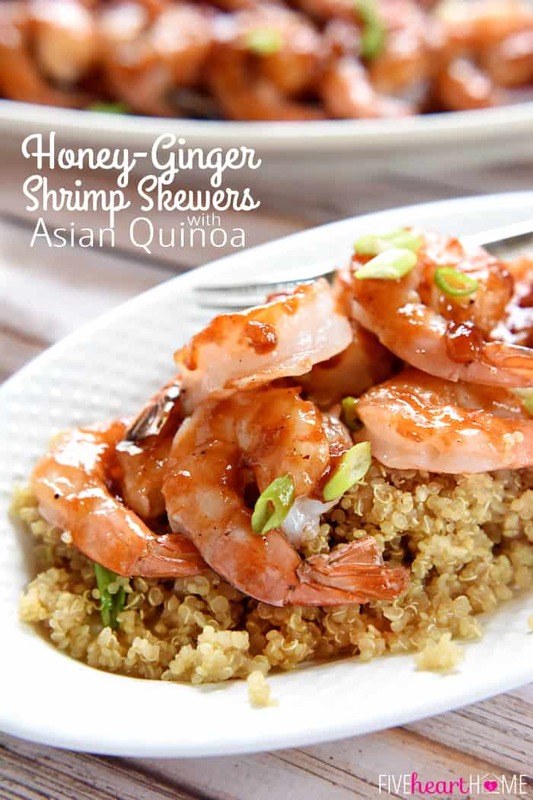 A delicious meal that's effortless enough for a weeknight yet special enough for company, Honey-Ginger Shrimp Skewers are glazed with a sweet and tangy homemade BBQ sauce and served atop a bed of flavorful Asian Quinoa, infused with hints of soy sauce, garlic, and fresh ginger. In a medium saucepan, combine apple cider vinegar, ketchup, honey, hot pepper sauce, minced garlic, minced ginger, salt, and pepper. Bring to a boil and then reduce to a simmer. Cook, uncovered, stirring occasionally until reduced and thickened, about 15 to 20 minutes (stir more frequently towards the end to prevent burning). Taste and adjust salt and/or pepper, if necessary. While the BBQ sauce is cooking, rinse the quinoa in a fine-mesh strainer under cold running water for a couple of minutes. Heat sesame oil in a medium saucepan set over medium heat. Add quinoa and toast, stirring frequently, for 2 to 3 minutes. Add chicken broth, soy sauce, ginger, and garlic. Increase heat and bring to a boil, then reduce heat to low and cover. Simmer until all liquid has been absorbed, about 15 minutes. Remove pot from heat but keep lid on to retain heat until ready to serve. Position rack in center of oven and preheat to 400°F. Line a large baking sheet with foil (for easy clean-up) and brush with a thin layer of olive oil. 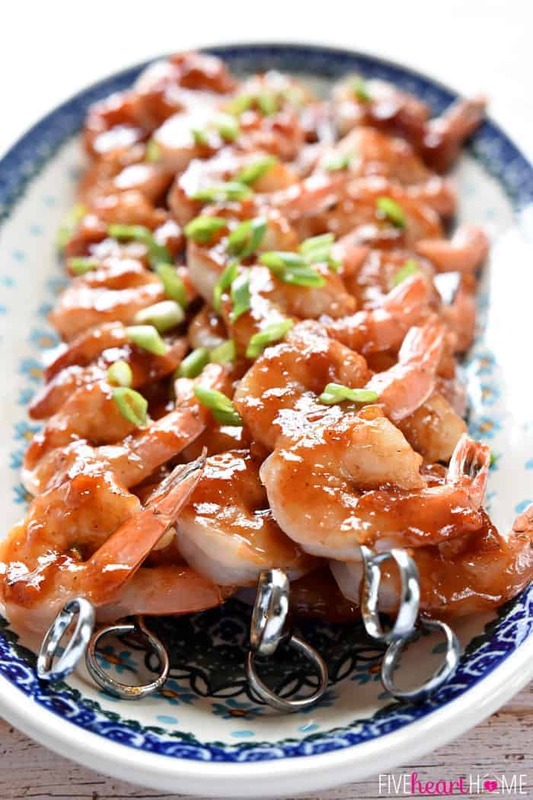 Thread shrimp onto long metal or wooden skewers and brush on one side with BBQ sauce. Cook for 4 minutes. Remove pan from oven, flip skewers, and quickly brush second side with remaining BBQ sauce. Cook for 2 to 4 more minutes or until shrimp are pink, firm, and just cooked through. 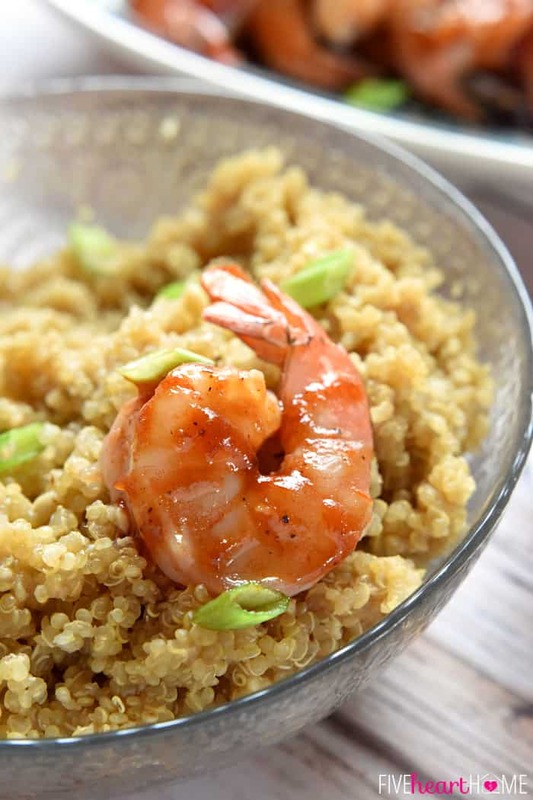 Fluff quinoa with a fork and serve shrimp atop quinoa. Rinsing the quinoa removes its natural bitter coating and gives it a milder flavor once cooked. Fresh ginger can easily be peeled with a spoon. I always keep a couple of hunks of fresh ginger (wrapped in multiple layers of freezer-thickness plastic bags) in my freezer. Then when I need fresh ginger for a recipe, I thaw a piece for a few minutes, carefully slice off the skin, and then grate it using a fine microplane grater. 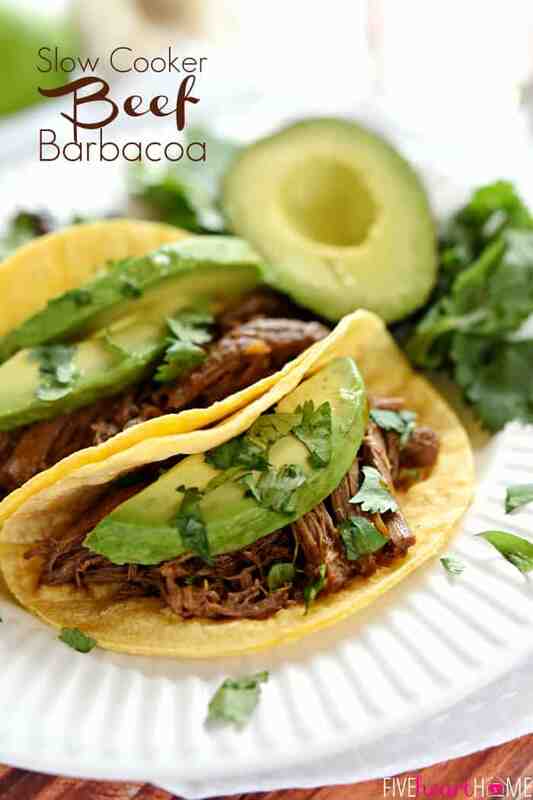 What a great way to use the ingredients – this sounds amazing! 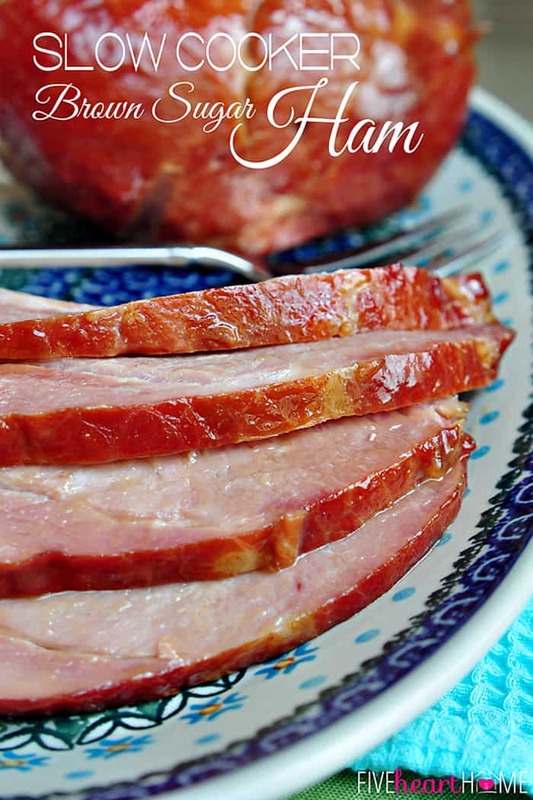 I found this post via Mandy’s Recipe Box’s “Totally Talented Tuesdays! 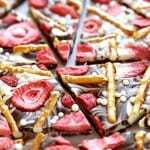 This looks wonderful, I will be trying this very soon. Yes please!! The shrimp and homemade BBq, both sounds to die for! These look great! I love the tip on the quinoa. I was happy to find your post over at Totally Talented Tuesdays! Oh my goodness, this looks amazing…my husband loves shrimp! Thank you for sharing! 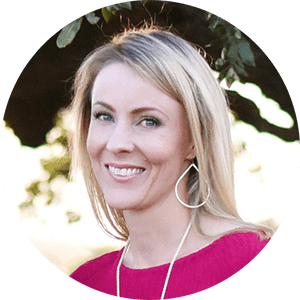 Have a wonderful week and please come share and link up with me now!! Mmmm love me some shrimp! This glaze looks fantastic! Seriously LOVE what you made! 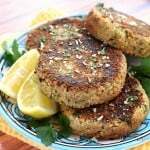 Shrimp is the only seafood all my boys will eat, so I will for sure have to try this! Pinned! Thanks so much, Jen! Smart boys you have…one of mine won’t eat shrimp and I just can’t understand it. 😉 I appreciate the pin and thanks for helping to coordinate such a fun blog hop! 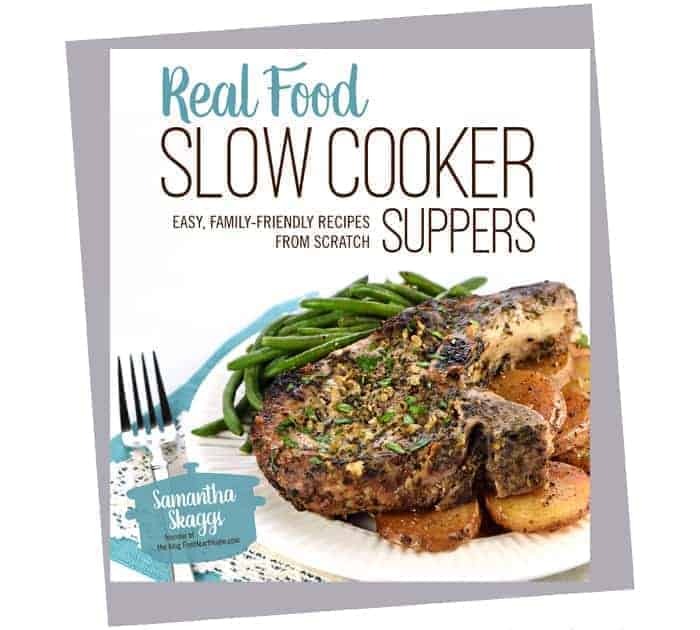 That glossy BBQ sauce is SO pretty, Samantha. I wish I could reach out and grab some of those skewers for an afternoon snack! Thank you, Andi! I think these would make a great afternoon snack…or a morning snack…or a midnight one… 😉 I appreciate you stopping by and hope you have a fabulous week! When I grate ginger, I don’t bother peeling it at all. I love frozen ginger, because I never run out!